Chinese BBQ meats (sui mei) are tasty and you will see them hanging in the windows of Chinese restaurants which specialise in roasting these meats. 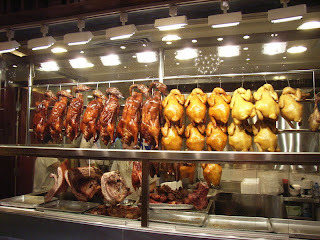 The more popular Chinese BBQ meats are roast duck (siu ngaap) and barbecued pork (char sui). One of my favourite Chinese BBQ meats is ‘sui yuk’ which is roasted pork belly - the combination of five spice flavoured pork belly with salty and crispy skin is delicious, especially dipped in chilli oil. brushing white vinegar onto the skin. I tried making my own sui yuk on the weekend. I bought a slab of pork belly from the butcher, cleaned it and poured boiling water slowly and evenly over the pork skin. I dried the skin with paper towels and left it to cool. The skin shrunk a bit and the sides of the pork meat became white and slightly cooked. I then scored the skin all over with a sharp knife and made lengthwise incisions into the meat side of the pork belly to help the marinade absorb into the meat. The amount of each ingredient depends on the amount of pork belly used (quantity on brackets are a rough guide for around 2kg of pork belly). I turned the meat over, skin side up and made sure that it was clean and dry (none of the marinade should be on the skin of the pork). I rubbed coarse sea salt onto the skin and placed the slab of pork belly on a dish uncovered into the fridge to marinate overnight. An hour before roasting I took the pork belly out of the fridge. I put the pork into the oven preheated to 200 degrees celsius and roasted it for 20 minutes and then took the pork belly out and brushed the skin with white vinegar and roasted it for a further 20 minutes. Then I took the pork belly out again and checked the progress of the skin to see how crispy it was getting. There was some areas of the skin which where tender and unblistered so I used a fork to prick the skin to let the fat/oil escape and used paper towels to dab the skin to absorb the oozing liquid. I returned the pork belly to the oven and continued roasting for another 20 minutes, turning the grill function of the oven on to help increase the crackling and crisping of the skin. After an hour of roasting the pork, I took it out of the oven and let it rest and cool down before chopping it into pieces. The ‘X’ factor that it was missing for me was the particular roasted flavour/texture that you get with Chinese BBQ meats that you buy from restaurants. I attribute it to the ovens that restaurants use which would be specially designed for roasting Chinese BBQ meats like a rotisserie style oven and I can’t replicate this with my little oven at home. My oven at home does not have the ‘X’ factor. If you want to buy Chinese BBQ meats with the ‘X’ factor, the best place to get Chinese BBQ meats in Perth is at ‘Hong Kong BBQ’ on 76 Francis Street in Northbridge. Leftovers can be refrigerated and the best way to heat it up it to stir fry it with a little oil, finely diced shallots, crushed garlic and a good dash of oyster sauce. After many disappointments trying to get the perfect crackling, I finally found the easiest solution. Dissolve a solution of 1 tablespoon of vinegar to 2 tablespoons of salt. Dry the belly skin and brush on this solution. Place the belly in the fridge to dry the skin overnight. Keep the solution and brush the skin again as many times as you can, after every few hours. Brush on the solution again before putting the belly in a 200C oven. After 20 minutes in the oven again, brush again. Regardless whether the skin is scored or punctured with holes or absence of X factor, the skin will still crackle. Try it and good luck! Thanks for your comment. the vinegar + salt mixture sounds foolproof! Will need to try it out.